The power of nature does not have to be felt only in the open space, but it can also be present in front of your door. Feng shui as a deeply creative and intuitive art is based on exceptional sensitivity to nature. This propensity to nature is shown in two ideologies that build the name Feng Shui - the "wind of water". Basically, these two elements shape the ultimate physical appearance of an appetizer. In practice, feng shui has two premises and two levels of empowerment. The first premise is that the human condition and its energy influence its environment in a good and bad sense. Another premise is that the state of the environment affects the person's internal state. The first of four different aspects of Feng Sui practice is - landscape decoration with feng shui. Landscape feng shui offers a system of techniques and knowledge that by studying and applying to the environment you can get a true insight into the quality of the energy of the place where you live. All-encompassing energy (chi) is sometimes described as the cosmic breath or the vital principle of the sky and earth, time and space and, consequently, interrelated phenomena. Energy is in a constant cycle of movement and transformation through seasons and weather changes, soil irregularities, tides and oscillations, through changes in our bodies, emotions and thoughts. There are three transformational phases in which energy dominantly carry a specific quality. They are called Sheng, Si and Sha. Sheng Chi - the place possessed when you perceive it as fresh and bright, when animals are healthy, vegetation is diverse and lush, people are successful. You have Sheng Chi when you feel positive desire. Si Chi - has a place that is plagued and devastated, if the land is exhausted and vegetation is poor, people are weak and volatile. You have Si when you're depressed and anxious. Sha Chi - dominates when you are extremely angry. The place is radiant with this energy quality when you feel it strange and dangerous. It starts from the negative states of the soil both below and above the ground. Even under the floor is sometimes called "harmful radiation", and above the ground is most often called "secret arrows". Awareness of the specific quality of energy that exudes our immediate environment opens the opportunity for us through our own engagement to create the conditions for transforming, calming, directing and moving slowly, turning and accumulating in front of the front door of the home. All the activities we undertake to improve our immediate environment must result in such a composition that will ensure that energy always flickers and does not allow its stagnation. Landscape feng shui can be practiced in two ways, more precisely there are two schools. 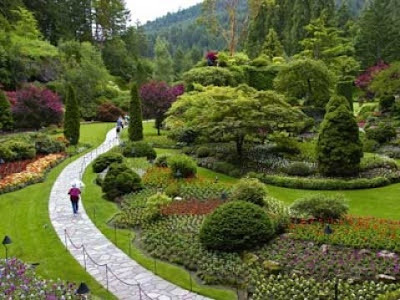 The topological school of feng shui provides rough views on the position and shape of the garden - the topological properties of the garden, its position, the shape of the plot and possible water elements, while the compass school is based on precise orientation and complex mathematical calculations. Common to both schools is to base their philosophy on the concept of complementarity, more commonly known as the Yin-Yang concept, then on the theory of five elements connected both in a productive and destructive cycle, and ultimately on the theory of trinity of happiness, Tien Ti Ren concept. For Yin and Yang, it can be said above all that they represent two dual types of energy. While Yin is a passive or deadened form of energy, Yang represents a creative, driving energy. By practicing the feng shui, we are trying to bring them into the equilibrium whole in which they will be interwoven and complemented. Viewed through the prism of the elements of the garden, water, flat or damp soil, shade and silence possess Yin energy. On the other hand, yang energy is present in every manifestation of life in the garden, in the growth of plants, in the joyous colors of flowers, then in the bright and sunny surfaces, as well as in the hilly ground. It is here that the feng shui gets in its importance and swings, because it helps us to integrate these elements into a harmonious whole. As Yin and Yang Dynamic Energy are changing, depending on the time of day, or the age of the year. First of all, this means that the garden should not be too flat, but not too hilly, it should also be sunny, the best morning sun, but also have shady segments.